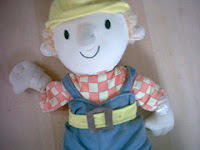 Bob the Builder looses his hand! Bob the Builder, a well known handyman, has become the victim of what the police refer to as 'The Limber'. Bob was found with his hands cruelly separated from his body. Doctors are not sure whether Bob's other hand can be saved. Bob has been released from the hospital and is at home. I have lost count of the number of stuffed toys I have fixed and am still fixing. But I joyfully admit I am glad we are out of the Bob and Dora stages. And don't get me started on Peppa... ha ha!